Next time, find out how Sweetcorn fooled Sally Jenkins. For starters, biographies of these men must “reflect the glory of sports” because, in their youth, these men were famous across the country as a result of their athletic abilities. Sure, newspaper coverage was often racist but it was respectful of their abilities and accomplishments. Sports opened doors to them that were not open to most young whites of that period. College was largely reserved for the elite. Few from the working class darkened the doors of these hallowed institutions. However, several Carlisle Indians were enrolled in major universities. These same schools complained about Carlisle not conforming to the same eligibility rules that they gave lip service to while recruiting the Indians to leave Carlisle and come play for them. Others leveraged their Carlisle fame into jobs away from the reservations where opportunities were few. Not many of them became rich, but sports were not a route to wealth for all but a few in those days. Amos Alonzo Stagg was probably the highest paid man in sports because he was making $6,000 a year as a tenured professor with the University of Chicago. 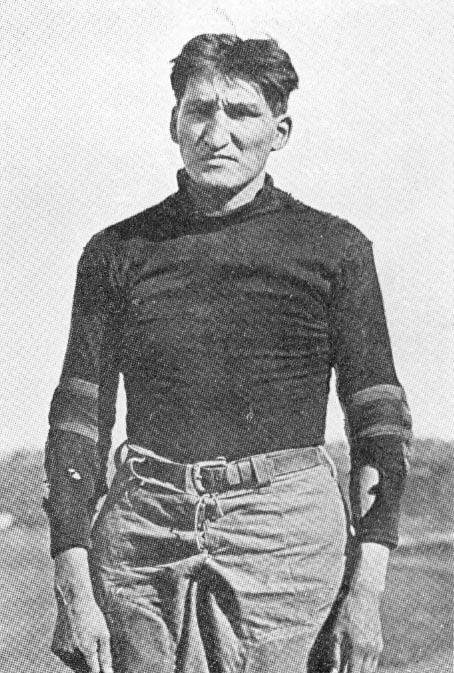 Jim Thorpe’s contract with the New York Giants paid him as much but only for five years. It wasn’t until Red Grange and Babe Ruth arrived on the scene that athletes became rich. By then, the Carlisle Indians who hadn’t retired from competition were in the twilight of their athletic careers. Most of the Carlisle football players I have researched rose from poverty into the middle class. Many of them worked with their hands in occupations that some consider menial today. But most Americans worked in “menial” jobs those days and very few went to college. The grandchildren of these men who have contacted me have gone to college and living middle-class lives. Ironically, their family histories parallel those of immigrant groups given that Indians are the only non-immigrants in the country. I spent some time researching the cause of Oscar Hunt’s death. First, I thought if I could locate his death certificate, I would find out what caused his death. I quickly learned that death certificates were not issued in Oklahoma till later that year and were not required then. It was some time that death certificates were routinely issued in Oklahoma. Next, I thought if I could locate the court records, they might contain something about his death. Because newspaper articles stated that his case was in Federal Court at Afton, Oklahoma, I contacted the Northern District Court in Tulsa. Their clerk informed me that the court did not exist until 1922 and referred me to the Eastern District Court in Muskogee. Their records don’t start until later in 1907 and a quick check of their card file found nothing. The clerk suggested that I contact the county court. Since Afton is split between two counties, Jay and Ottawa, it was necessary to contact both of them. Unfortunately, they had no records prior to statehood. A clerk did recommend that I contact the Muskogee Court House because that court was older than many others. Muskogee had nothing prior to statehood, either. No one seems to know if records for trials that took place in Indian Territory still exist and, if they do, where they are preserved. My next stop is at the National Archives in Fort Worth. I fear that finding Hunt’s legal records will be like looking for a needle in a haystack. Steve Hawkins and a volunteer researcher at Oklahoma Historical Society located some 1907 newspaper articles related to Oscar Hunt’s untimely demise and sent copies of them to me. What a treasure trove of information that package included! They found some pieces from the Miami, Oklahoma Record-Herald and the Afton Climax from March and April of 1907. These short news reports help shed light on what happened. The first one, dated March 1, 1907, in its entirety said, “Oscar Hunt is under arrest for the killing of Joe Wolfenberger in the Seneca nation last Saturday night.” Now we know that Hunt had indeed been arrested for murder as well as when and where it took place. Two weeks later, the Afton Climax reported on Oscar’s preliminary hearing after which he was released on $1,000 bond, which he furnished. None of the witnesses, who had apparently been with Hunt and Wolfenberger on a drinking binge, could remember none of the details of the drunken fight on the way home from Tiff City that left Wolfenberger dead. Two weeks after that, the Afton Climax blared, “Oscar Hunt Gone Insane.” Perhaps he had probed his innermost depths of his being, reflected upon what he may have done and couldn’t handle having killed someone while drunk. So distraught was he that “It is reported that it takes several men to hold him and it is probable that he will be taken to some asylum soon, should his condition not improve.” He was released on bail to go to his home near Cayuga. The final episode came two weeks later when the Record-Herald reported that Oscar Hunt had died. More research will be needed to find out the cause of death. 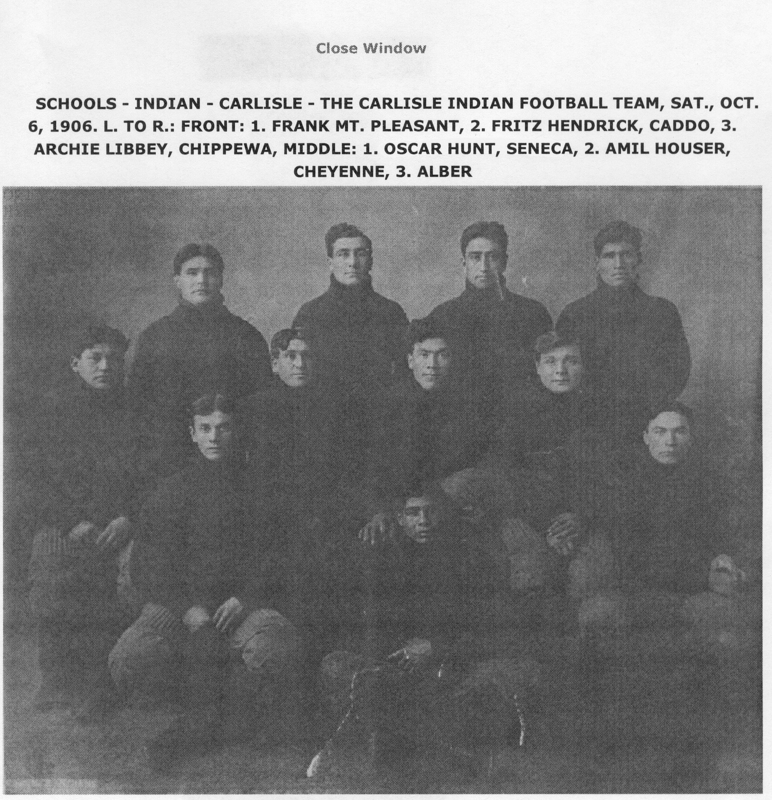 1906 Carlisle Indians. Oscar Hunt second row, far left. Roberts on Sept. 3, 1876 was the youngest of 100 Pawnees chosen as scouts for soldiers assigned the job of avenging Gen. George A. Custer’s death In the battle of Little Bighorn. He enlisted under his boyhood name of Ahrekahrard. Roberts was born in Nebraska and came to Oklahoma on a long trek with his tribe in 1874-75 when the government established a Pawnee reservation. Roberts was first married in 1882 to an Indian girl whose name translated into English as Captive Princess. She died a year later. Polygamy was then customary in the tribe and he next married three daughters of Kaheeka, principal chief of the Skedee band of Shawnees. On Sept. 18, 1876 Roberts and his fellow recruits were formally mustered into the army at Sidney, Neb. In a little over a month after his enlistment, Roberts, then 17, was in battle…. Roberts subsequently traveled with the William F. (Buffalo Bill) Cody’s Wild West Show in 1884-85…. Was Rose his sister by blood? Was she really his wife, or just living in his house? Perhaps future research will find the answers to these questions.